This time I’ve chosen taleggio-stuffed meatballs and spaghetti, with a spicy tomato sauce. These meatballs distinguish themselves from more traditional ones in several ways. They are prepared with ground dark meat turkey, and shaped into bite-sized spheres –around 1.5 inches in diameter. I stuff them with small cubes of creamy taleggio cheese, and then conveniently roast them rather than brown them in a skillet. Whole Foods sells ground turkey thigh meat in my area, but you should be able to find or order it from local stores or shops. If you can’t find taleggio, a good Italian fontina or even plain harvarti works equally well. My husband groans whenever I say “ground turkey,” but was crazy about these meatballs, and has helped himself to seconds, and even thirds, each time I’ve offered them. My assistants who created the recipe with me have jumped at the chance to take home leftovers, and have served them to great reviews. My hope is that this recipe will add some solace to these fraughtful times. 2. For meatballs, arrange a rack in the middle of the oven and preheat oven to 400 degrees F. Line a large baking sheet with parchment cut to fit. 3. To a large mixing bowl, add turkey, onion, 1/2 cup bread crumbs, 1/2 cup Parmesan, 1/4 cup parsley, rosemary, salt and pepper. Using a grater (such as a microplane) grate the garlic clove into the bowl. Using a fork, stir in the egg and continue to mix until all ingredients are blended well. With your hands, roll the mixture into 1 1/2-inch balls (using 2 tablespoons for each) and place them on the baking sheet with a little space in between each. You should get about 28. 4. Cut the taleggio (including the rind) into 1/4 to 3/8- inch cubes. (If using Fontina, remove rind.) With a finger push a cheese cube into the center of each meatball and then reshape firmly to enclose the cheese. Cover meatballs with plastic wrap and refrigerate to firm, at least 45 minutes or longer. 6. Cook the pasta according to package directions and return to its pan. Toss with olive oil. 7. Divide pasta among four shallow bowls and toss with some sauce. Add meatballs to each serving and sprinkle with some remaining Parmesan and parsley. Serves 4. 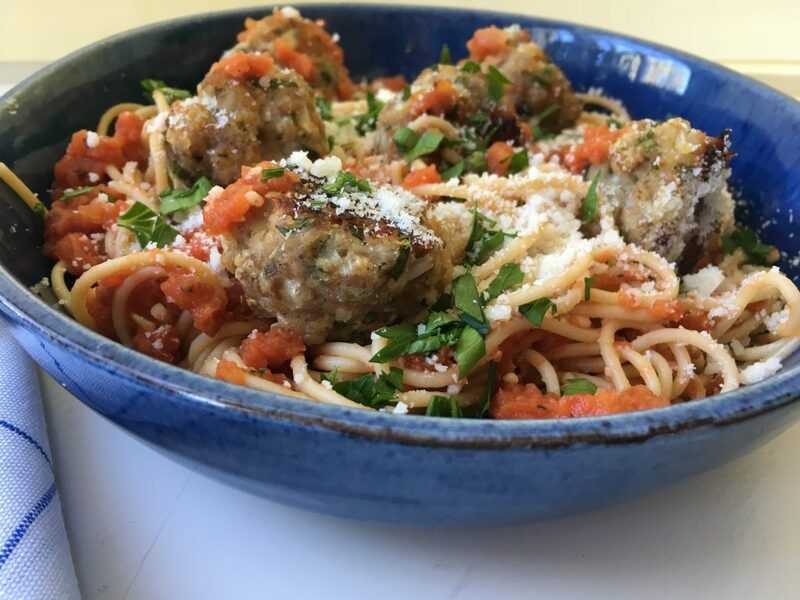 This entry was posted in Food News and tagged comfort food, meatballs, spaghetti, taleggio by brosbottom. Bookmark the permalink. Thanks for your thoughtful post. These are stressful and trying times, indeed! I will definitely make this recipe. 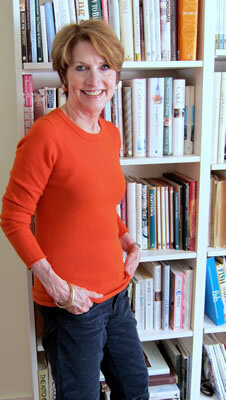 I took classes from you a few decades ago at la Belle Pomme and have most, if not all, of your cook books. I currently live out of the country but brought American Favorites with me. As a matter of fact, I just made your peppered salmon and corn chowder yesterday. It’s an autumn and winter favorite. My husband commented that it had been too long since I last made it. Thanks for your inspiring words and recipes! Thank you so much for taking time to write such a thoughtful note. I hope your husband and you will enjoy this recipe too!! Nothing beats comfort food like spaghetti! I’m going to try this one for sure! Thanks so much, Kay. Hope you’ll enjoy it as much as we have!